Daenerys Targaryen is a badass. You better believe it. With Game of Thrones George R.R. Martin crafted a universe full of (tons and tons and tons) complicated and complex characters. Many of the main characters have strong, individualized voices and even out of context, almost any quote can be quickly placed to its speaker. In a world of dozens of characters that is no small feat. Daenerys Targaryen is one of the most powerful female characters in the series, and isn't afraid to tell you all about it. Click here to check out Daenerys' gear at the HBO Store! Daenerys Targaryan, Khaleesi, has had one of the most amazing arcs on the show, starting as one of the last of her family, then sold to Khal Drogo, who made her his queen. She was then reborn a mother to dragons, and is currently running around with them, conquering lands, and freeing slaves. In the process, she has made a number of epic speeches and put plenty of people who would dare sass her firmly in their place. Vote up the best Daenerys Targaryen quotes from "Game of Thrones" below and read up on all things "Game of Thrones" on Ranker of Thrones, including quotes from other characters. 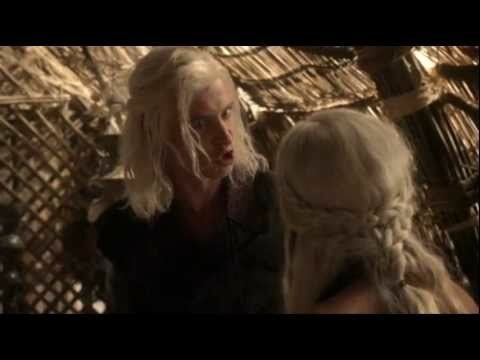 "I am a Khaleesi of the Dothraki! I am the wife of the great Khal and I carry his son inside me! The next time you raise a hand to me will be the last time you have hands." "Yes. All men must die, but we are not men." "He was no dragon. Fire cannot kill a dragon."